Available for purchase soon! For quote or availability details, call (800) 259-8989. 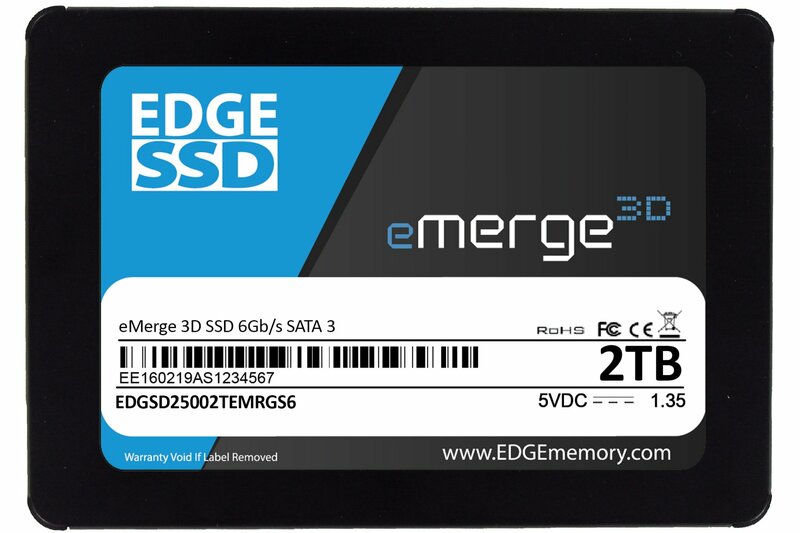 EDGE eMerge 3D SSDs are TAA compliant, built with premium controllers, and backed by a superior five-year warranty. 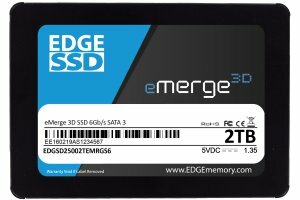 Take system performance to the next level with the EDGE™ eMerge 3D SSD. Featuring the Silicon Motion SM2258 controller and quality 3D MLC NAND, eMerge 3D SSDs are loaded with enhancements to promote a high performing and reliable computing environment. TRIM, Wear Leveling, StaticDataRefresh, and LDPC ECC functions optimize data processing efficiency. S.M.A.R.T. and a built-in temperature sensor assist with monitoring drive health. The eMerge 3D provides outstanding transfer speeds. Improved system startup, data access, application loading, and backup times are typically realized when upgrading systems from a traditional spinning disk hard drive to an eMerge 3D SSD. External DRAM and SLC Cache is included and further enhances read/write and IOPS ratings. The eMerge 3D is an ultra-low-power storage solution with DevSleep support, providing improved notebook battery life and lower cooling costs in datacenters. *Will function in a SAS environment but will not have SAS specific features. Reliability - StaticDataRefresh detects and corrects data errors early before becoming problematic. A built-in temperature sensor monitors internal drive temperature.